Don't fret for a moment about what to get your mom for Mother's Day. The best thing you can do is to spend time with her (no irritation or annoyance allowed), or have a nice, relaxed conversation with her. No store bought card or pot of flowers will touch her heart as much as your efforts to express your sincere appreciation for her, past and present. 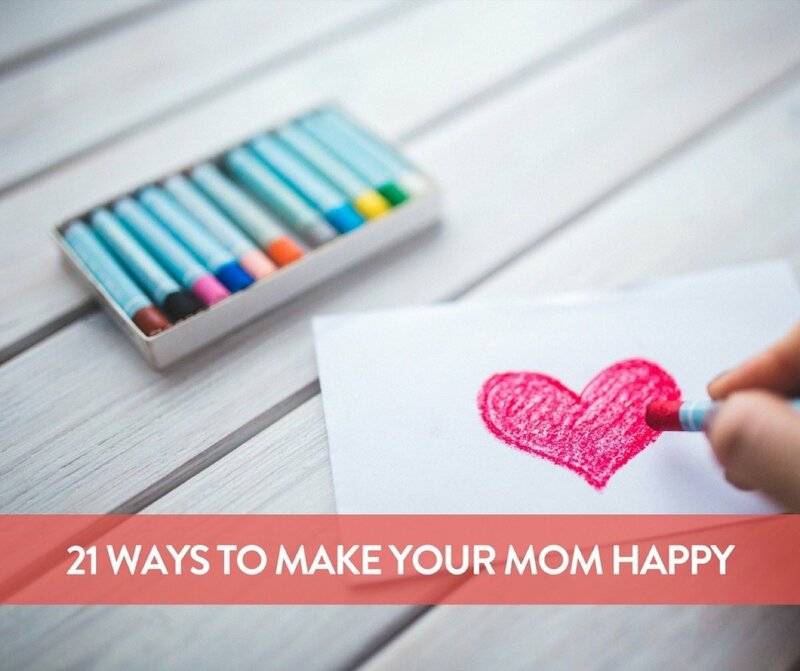 To help you get started, here are 21 mostly free ideas to choose from that are guaranteed to make your mom happy. 1. Go shopping with your mom. I know, this might feel awkward, but it will prove to her that you really want to spend time with her. Possible bonus: she'll end up being so grateful, she'll start buying you stuff. 2. Have her to invite her dearest friends for a brunch that you'll host. There's nothing better than a mom getting to show off her pride and joy to her friends. 3. Help her with some sort of redecorating project. It could be tedious, but again, it shows you're so interested in being with her and helping her that you're willing to make the sacrifice. 4. Ask her what movie or television series she's been wanting to see and then plan a time to stay in and watch it with her. Again, it's the idea that you can take time for her that will deliver the impact. 5. Tell her that you realize some of your best qualities came from her! She'll love the compliment, but she'll be even more thrilled that you've reflected on this. 6. Tell her about something going on in your life and then ask her about what things were like when she was this age. Most moms want their kids to know that they're not so far away. The memories of being a young adult are still vivid and life was equally exciting and perplexing. 7. If you have your own kids, ask your mom how she handled certain situations like your obnoxious childhood friends! She may have worked through some things and may have helpful insights. 8. Take a photo of the two of you together, print it, and frame it. She'll think of you and that moment every time she looks at it. 9. If you live in different cities, tell her what you're doing on Mother's Day and then tell her how much you wish she was there so you could do it together. This will maker her feel almost as good as being there. 10. Schedule regular time together. A monthly lunch or wine date will be something you both look forward to. 11. Surprise her with a farmer's market bouquet. These bouquets are often the most beautiful and affordable floral options. 12. Hit the museums! Many museums are free (and if not, the cost of entry is usually affordable). Taking a quiet afternoon to stroll through galleries is good for your mom's soul. 13. Take your mom on a mini road trip. Choose a favorite town within driving distance and enjoy time on the road, and a day of exploring, together. 14. Choose a meaningful service project to do together. Think of a cause that's near and dear to your mom's heart, and log some volunteer hours alongside her. You'll get special time together, and serve others in a meaningful way. 15. Make your mom a "movie". Using an online app like Animoto, you can upload your favorite photos and videos, choose music, and create a touching movie for your mama. 16. Shower her with compliments. Telling your mom how much she means to you will mean the world to her. It can be as simple and a call or text every so often. Or, as regular as a monthly letter letting her know how much you love her. 17. DIY together! (You knew this one was coming!!!) Choose an art or simple project, gather the supplies, and enjoy some time creating with your mom. 18. Take a fitness class together. Dance, yoga, pilates, good ol' fashioned aerobics. The sky's the limit! Finding affordable, fun classes is easy to do and most studios offer drop-in options. 19. Invite your mom to do something you're passionate about. A class, a concert, a place that's special to you. She will LOVE the special glimpse into your world. 20. Gift your mom a playlist. Include the songs she loves, as well as songs that hold meaning to your childhood or your relationship. It will be poignant and moving, and she'll love experiencing the songs you chose for her. 21. Sincerely tell her what a great mom she has been and what a happy childhood you had. Then, the absolute best thing you can do is to tell her that you still value her wisdom and experience and that you're grateful she's the one that is still scouting ahead for you, and you'll always need her good advice. Now top it off with a cherry by reminding her how much you love her. i love you mommy!! !ill make you happier!! !P.S.YOURE SO AWESOME!!! I love my mum so very much. She gave up her job as a bank accountant. Our nanny was very mean but our mum gave up work just for us. She does everything for us even if its out of her comfort zone. I love you mom . You are the best mom in the world and i am very lucky that god me such a loving caring mum . I can do anything for you maa. I want her to keep happy and smiling .Mum its only because of you i am alive today .Thank you maa love you . I luv my mum sooooooooooooooooooooooooooo much!!!!!!!???????????????????????????? Weeeeeeee Kim bibbleeeeee??????????????????????????????????. I am the queen of bible???? My mum is THE BEST THING EVAAAAAAA! My mom works 24/7, to support me .. I feel as if I am a ungrateful child. I just want to see my mom smile and laugh. And just be happy again . My mom and I never really got along, but after using these tips we got closer as family and friends. I know it sounds cheesy but I LOVE YOU MOM???? Me and my mom don't get along, and I always feel like I can't win on trying to make her happy. This gave me ideas so I don't have to cry or hurt so much anymore. I love my mom very much, and she has always been hard on me but she says it's for my own good. I love you, mom. And I hope you love me too.?? My mom finally knows my struggles and what i went through and she accepts me or my strengths and weaknesses and wants to see me change and im trying to beat this pain i feel im sorry mom i didnt mean it and i love you.